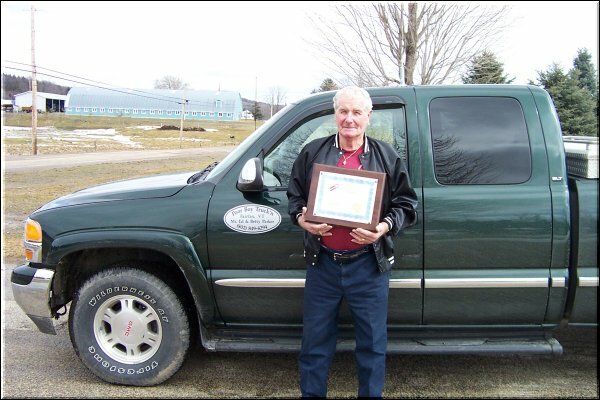 At a recent Vermont Green Mountain Chapter meeting, three members received American Truck Historical Society awards. 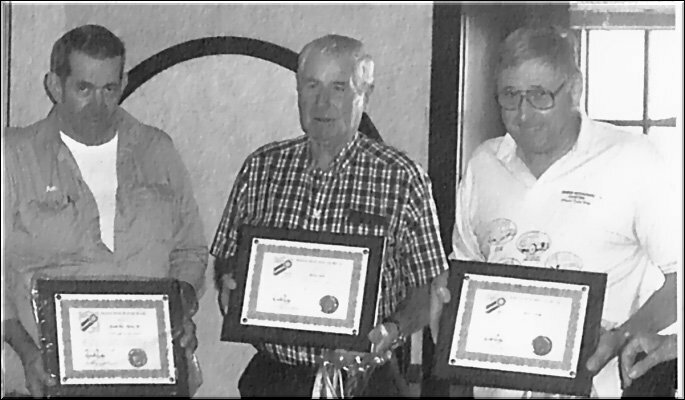 They included (from left) Ken Deuso, Ken Deuso Trucking Inc., 50 year Company award; Ed Parker, Golden Achievement award; and Dave Durling, Golden Achievement award. Deuso bought a 1952 GMC 450 5-yard dump truck in 1952 and started hauling for a sand and gravel company then later plowed snow and sanded roads for the Vermont Highway Dept. Today he works primarily on highway construction and earth work projects. He has owned a variety of trucks over the years, but says he prefers Macks. Parker was born into a Vermont farm family in 1927, and grew up driving trucks to load hay and haul livestock and milkjugs. He later went to work for St. Johnsbury Trucking, then drove trucks while serving in the U. S. Navy. After his stint in the service, Parker returned to trucking full-time, hauling lumber, logging and in highway construction for the Perini Bros. He drove for Merrill Transport, a lumber company for 12 years and 10 years with Engineers Construction, where he continues to work on a seasonal basis. Durling began working in the trucking industry in 1944 when he was 15 years old. He has worked for Gay's Express, West Coast Freight, Nu-Car Carrier, Safeway Trail Ways, MatLack Inc., Gleason Transportation, St. Johnsbury Trucking. He retired in 19943, but continues to drive coast to coast as a spare driver for BDR Transport of Bellows Falls, Vermont, and for Mills Transport of Monroe, New Hampshire.